The Ulefone Gemini Pro is an upgraded version of the Ulefone Gemini. The Ulefone Gemini is an affordable budget device with great features like 13MP + 5MP dual camera set-up and great battery. Definitely, the Ulefone Gemini Pro will possess features that will better the Ulefone Gemini. But before jumping into that conclusion, let’s take a look at the Ulefone Gemini Pro. Looking at the structural design, front and rear view of the Ulefone Gemini Pro, anyone who is conversant with smartphones would not help but notice the resemblance this device shares with the iPhone 7 Plus. Nonetheless, the Ulefone Gemini Pro boasts of a beautifully crafted full metal body with a well-designed curved glass. The device is a beauty to behold and its and 155 x 76.9 x 8.4 mm dimension and 181grams weight confirms its sleekness. 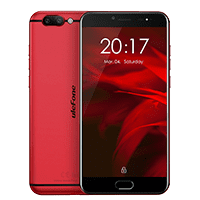 The Ulefone Gemini Pro comes in only two colour variants; Red and Black. There is a pill-shaped home button present below the screen that also doubles as a fingerprint scanner. The Ulefone Gemini Pro has a wide 5.5-inch Full HD display. The screen is adequately protected with Corning Gorilla Glass 3 2.5D glass that prevents the screen from scratches and shatters. The screen has a resolution of 1080 x 1920 pixels which is perfectly fitted for high quality display both indoor and outdoor. The Ulefone Gemini Pro is powered by the MediaTek Helio X27 MT6797X Deca-core processor. The processor is way more powerful than the predecessing Ulefone Gemini that had a Quad-core processor. To handle smooth running of applications, a huge 4GB of RAM is on-board; 1GB bigger than the RAM on the Ulefone Gemini. There is also an improved 64GB internal storage memory that can be expanded to 128GB using the second SIM card slot as a micro SDcard slot. Remember the Ulefone Gemini comes with an Android v6.0 Marshmallow operating system. Well, as expected, the Pro version comes with the latest and recent Android v7.1.1 Nougat operating system. The cameras on the Ulefone Gemini Pro are the kinds that you would rarely find on any other smartphone. On the rear, the device rocks a dual camera set-up in the manner of a SONY 13MP chromatic lens which captures images and other details and another 13MP SONY monochrome lens which performs the duties of recording colours. The monochrome lens is even more advantageous as it captures beautiful images under low-light. The front camera is an 8 megapixels camera that can be interpolated to 13 megapixels. The selfie cam should take high quality selfies and crystal clear image production during video calls. An improved 3,680mAh battery which cannot be removed is what keeps the Ulefone Gemini alive. Unlike the Ulefone Gemini, the Gemini Pro comes with Fast-charge support and relatively longer usage time (450 hours of standby capacity), 9 hours of movie play and 25 hours of music play. The Ulefone Gemini Pro retails for a price between $250 and $280.